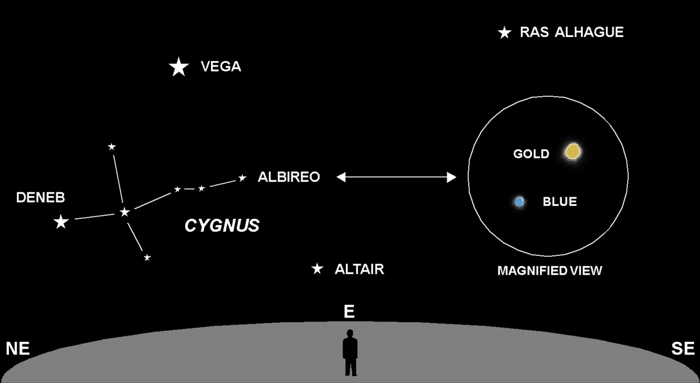 Cygnus (The Swan) is rising in the east an hour after sunset. The star Albireo marks its head. Although it appears as a single point of light to the naked eye, Albireo is actually a double star with distinctly colored gold and blue components. Double stars are attracted to each other by gravity, with both stars orbiting a common center of mass. Surprisingly, it has been estimated that over half the stars you see in the sky are, in fact, multiple-star systems. Our own Sun, being a “loner,” is in the minority. In all but a few cases, you will need some amount of magnification to see double stars. Astronomers call this “splitting the double.” So grab your binoculars or telescope and check out Albireo. You will be rewarded with a beautiful sight. The brighter of the two stars is a distinct gold color, the other a pale blue. The vast majority of double stars are similar in color, which is what makes Albireo such a visual delight. These two stars orbit each other with an estimated period of 7300 years, so you won’t actually see them revolving. Careful measurement over a long time is required to discern any motion. The pair is about 380 light years distant.